The V formation suspension from Bilstein. This System is characterised by excellent driving dynamics and an aggressive car design. 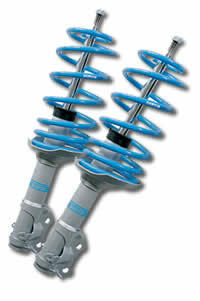 The shortened shock absorbers are optimally tuned in elaborated road tests for the 60/40 lowering springs. High-strength, prorgressive Springs and shock absorbers with degressive characterisation in O.E. quality come into operation. The Power kit is unbeatable in the cost/performance ratio.